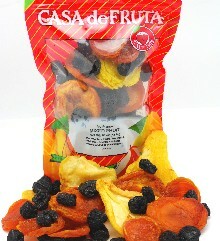 This tasty dried fruit mix includes jumbo fancy pears, fancy jumbo peaches, dried pitted cherries, fancy nectarines and fancy apricots. It's a great mix to enjoy as an on-the-go snack, or on your favorite morning cereal and on salads. Packaged in a 16 oz. bag.